Art Factory Body Art & Party Place: ALL ABOUT COPYRIGHT FOR FACE AND BODY ARTISTS. ALL ABOUT COPYRIGHT FOR FACE AND BODY ARTISTS. This blog post has been in the making (in my head) for a long time, I hope you find the information useful. I have been fortunate to travel the US and meet so many body artists and teach marketing classes – I am truly blessed. The topic of copyright law is always hot whenever I bring it up, I thought I should share it in writing here. First I must state that the information I am going to provide you with has been collected from lawyer advisors that I hired for help with my business and Ybody, and also from my experience as a graphic designer and commercial artist for over 14 years. No, I am not a lawyer, I am one of many artists in this world who spend countless hours creating original logos, symbols and stencils from scratch daily. 1. How much is 20%????? Since this is not something you can put on a scale or pour into a cup, how do we measure 20% difference in design? So if I have to make a tattoo or face design and it is similar to or Hello Kitty by only maybe 50% resemblance is that legal? I can move the bow from the right to the left, make her nose a little fatter and reduce the amount of whiskers, will that be 20% off? If you have a design that is a Hello Kitty look-alike, and people buy it because it looks like Ms. Kitty that all the girls LOVE, then you are relying on someone else’s art work in order to promote your product – that is copyright infringement. In one of my classes I met a student who explained it nicely. If I go to a store and buy Hello Kitty fabric, and I come home and make a blanket out of it, then post it online and sell Hello Kitty blankets – that’s copyright infringement. I was able to promote my products because they looked like Hello Kitty. I may have made the blankets, but the appeal was due to the character. So how does it apply to our market of face and body art you ask? If your business relies on other art sources in order to book parties and gigs, that is copyright infringement. But, once you are already at the festival or birthday party, and a little girl asks you to paint her like the famous kitty, maybe you should not deny her the pleasure (make your own judgment call). My recommendation is to make sure your website and your marketing tools such as postcards and business cards do not have copyrighted subject matters. Keep your work original and clean – make sure the variety you display shows your skills as an artist. Trust your client to figure out that you can paint anything the kids would like. The quality of your art is what will sell you the best, not your ability to paint a cat or a mouse of any kind. You will find that even without displaying famous characters you will still have a line and make loads of happy faces! 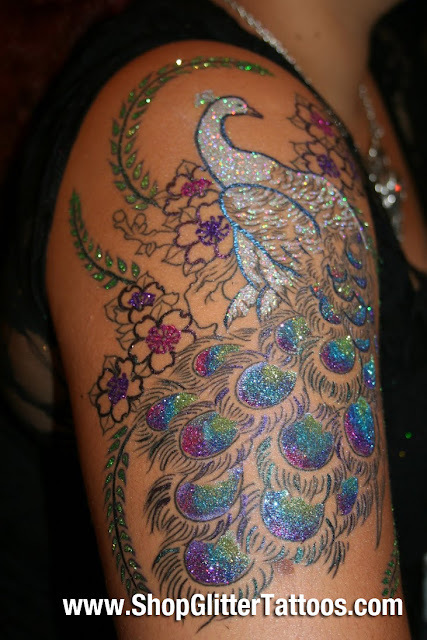 When it comes to glitter tattoos, my suggestion, based on a lot of research and pricy lawyer advice, is for you to take down all the characters just like I did. (I know you are gasping) I did too… I took ALL my best sellers off the shelf! I would be lying to you if I said it wasn’t a scary choice! After all, I run a business that has employees, what kind of a risk am I taking by removing ALL of our best sellers? I had to do it! I learned that if I sell look alike designs I am putting ALL of YOU at risk! Since there is no way for us (Ybody) to legally assume responsibility, once you buy those stencils you are at fault too… you can NEVER blame your supplier. I learned that even if I did purchase the license to sell those characters, the license to sell and profit from stencils, would not transfer to you when you purchased them! Its one thing to take that (dumb) risk with my own business, but if I make all of you make the same mistake I must be a criminal! You know me, Jewish mom, I could not sleep at night thinking that I possibly put hundreds of self employed individuals at legal risk. So off they went… all my ‘besties’! I quickly learned that the kids at the festival didn’t even miss the cat or the mouse, they where just so thrilled to get some glitter on! We replaced those popular images with age appropriate new designs and tested it at a local watermelon festival that generates about 20,000 people in 6 hours. No one was missing them. No one even asked about the cat or the mouse! We had so many smiling kids and happy parents come visit us. 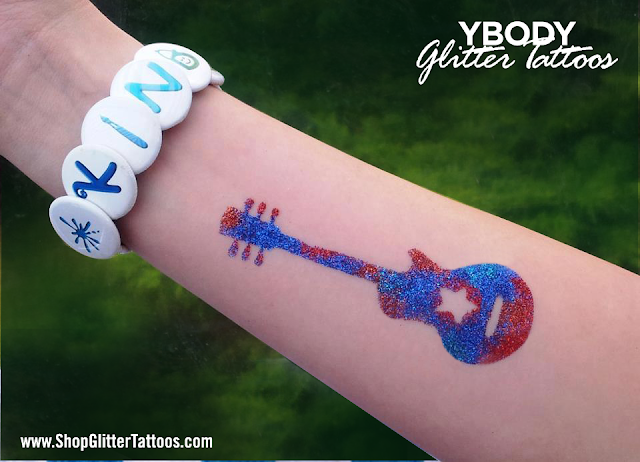 Even more than years before, and now that the glitter tattoos are more popular the kids spot us from far away and get super excited! The truth is, even if the 20% law applies to the popular characters, Disney, Warner Brothers, Sanrio (Hello Kitty) all have enough money to put us out of business in a blink of an eye… and if you ever wonder how much the licensing cost per character is, well, we checked on that too. They run about $30,000 EACH CHARACTER per year just for the right to use the graphic before you even start producing the designs. Now think about your tattoo board and do the math, is it worth it? Your business? Your reputation? There is one more thought I want to leave with you, I often see some artists post on threads on Facebook about other artists stealing photos of artwork and use them to promote another business, I know you guys get furious, and I know its emotionally draining and upsetting, If just for once you remember that feeling when someone uses your artwork on a business card or a website, it may help you remember to avoid doing it to others. Is it okay to reuse glitter tattoo stencils? Face Painting for Festivals Series: Part 2- Preparing For Your Festival! How to be Creative, Even Though You're Not! Face Painting for Festivals Series: Part 3- Setting Up Your Booth for Success! 2018 Winter Sale! Stock up and save! Paint Parties, How To Run A Profitable Event.